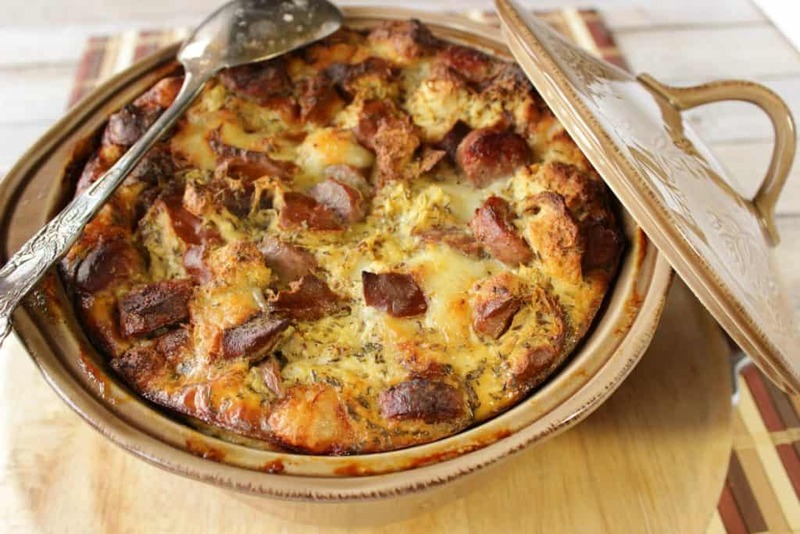 I’m adding this recipe for Savory German Bratwurst Sauerkraut Strata with Pretzel Rolls to my list of Oktoberfest favorites. 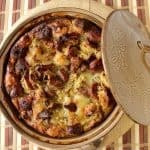 It has all the German flavors I love combined into one casserole dish, and then baked to perfection. Hearty, meaty chunks of German bratwurst are simmered in beer and caraway before being combined with pieces of soft, flavorful pretzel rolls. Next they’re mixed with tangy sauerkraut, stone ground mustard, and lots and lots of Swiss cheese before being smothered in an egg, milk and mustard mixture and then baked to a delicious golden brown. 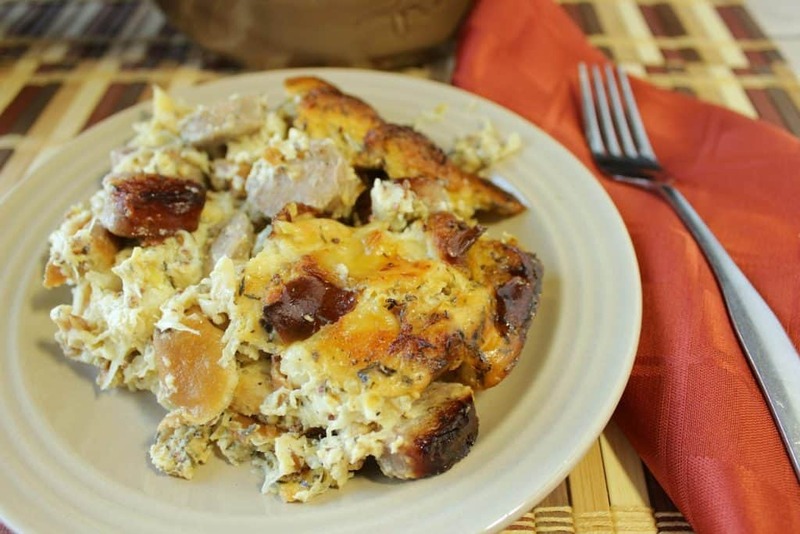 If you’re hosting (or attending) an Oktoberfest potluck celebration and are looking for a relatively easy dish to make that will feed a crowd, then this Savory German Bratwurst Sauerkraut Strata with Pretzel Rolls might be just the ticket. Pierce holes in bratwurst and simmer in a skillet along with 12 ounces of beer and 1 tablespoon caraway seeds. Simmer the brats for 10 minutes. Cool, and cut the partially cooked brats when cool enough to handle. Reserve the cooking liquid. Rip 6 pretzel buns into bite sized pieces and place in a large bowl. Add 1½ cups drained sauerkraut to the bowl with the pretzel buns, along with the chopped bratwurst. In a large bowl, whisk together 8 eggs, 2 cups milk, the reserved cooled beer and caraway from the skillet, ¼ cup German stone ground mustard, salt and pepper. Pour the egg mixture over the sausage, pretzel and sauerkraut in the bowl. Mix well to combine. Cube 3 cups of Swiss cheese and add it to the bowl along with 2 teaspoons thyme leaves. Stir well. Pour the mixture into a 3 quart casserole dish that has been sprayed with olive oil. 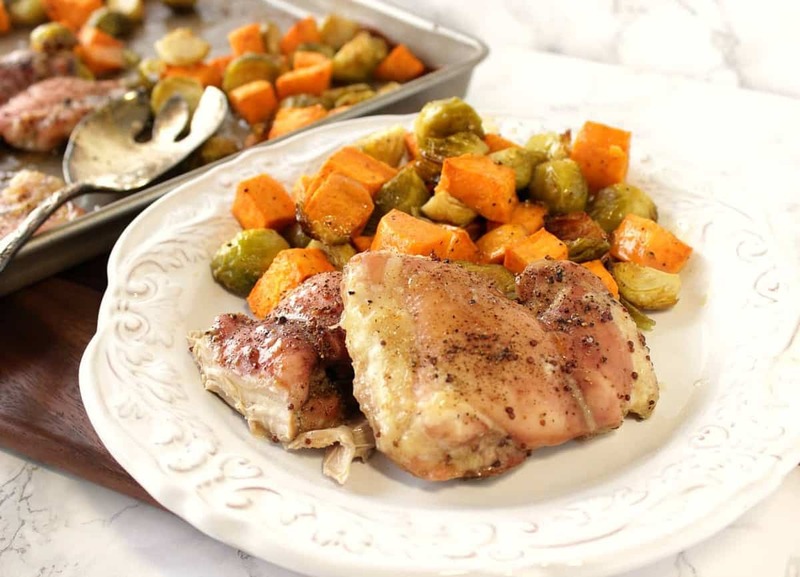 Cover and bake in a preheated 375 degree oven for 1½ hours. Remove the cover and continue baking for an additional 45 minutes (or until the center of the strata is cooked through when a skewer is inserted in the center. Serve hot. Hearty, meaty chunks of German bratwurst are simmered in beer and caraway before being combined with pieces of soft, flavorful pretzel rolls. Next, they're mixed with tangy sauerkraut, stone ground mustard, and lots and lots of Swiss cheese before being smothered in an egg, milk and mustard mixture and then baked to a delicious golden brown. Use a paring knife or fork to poke several holes into each bratwurst. Add the beer and caraway to a large skillet. Add the bratwurst to the skillet and simmer for 15 minutes. Remove the bratwurst to a cutting board and allow to cool. Reserve the beer and the caraway from the skillet. Set aside to cool. Tear the pretzel rolls into bite sized pieces and place them in a large bowl. Add the drained sauerkraut to the pretzel bowl. Once cool, chop the bratwurst into 1" pieces. Add the chopped brats to the pretzel bowl, along with the reserved beer from the skillet. In a large bowl, whisk together the eggs, milk, mustard, salt and pepper. Pour the egg mixture over the brat and pretzel mixture. Add the cubed Swiss cheese and thyme leaves into the bowl and stir very well to combine. Spray a 3 quart covered casserole dish with olive oil spray. 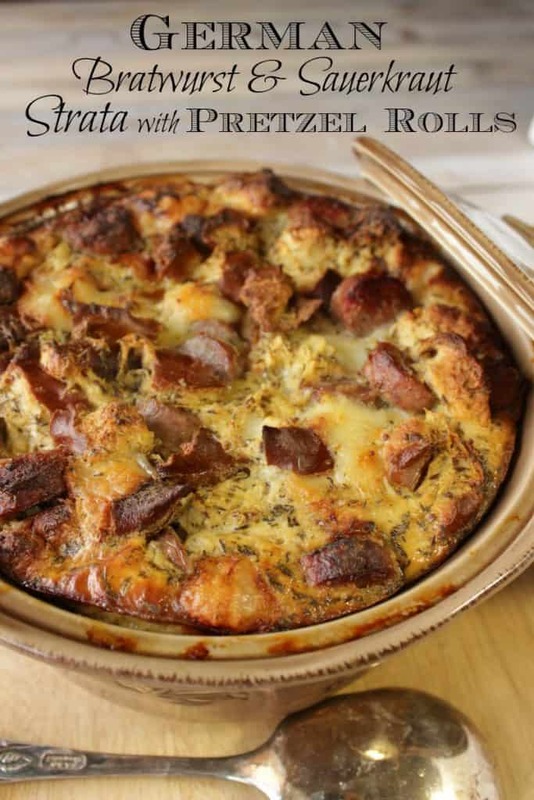 Spoon the bratwurst and pretzel mixture evenly into the prepared casserole dish. Cover and bake in a preheated oven for 60-70 minutes. Remove the cover and continue baking for an additional 45 minutes, or until the center is set and when a skewer inserted in the center comes out clean. 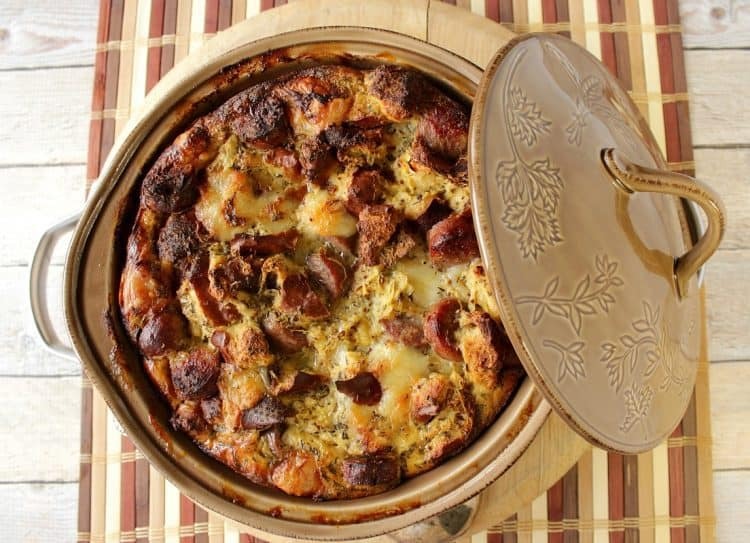 This Savory German Bratwurst Sauerkraut Strata with Pretzel Rolls may be made (and refrigerated) up to 24 hours in advance of baking. If refrigerated, allow the strata to sit on the counter for 30 minutes before baking to take the chill off. The following Amazon.com items are some suggested products I’ve chosen that will aid you in the making of this recipe, if needed. By clicking on the photos, you’ll be taken directly to Amazon.com website if you’re interested in purchasing any of these products. You are in no way required to do so, and you will not be charged in any way unless you decide to purchase a product. Should you have any questions or comments about the recipe I’ve shared today, I’ll be happy to answer it for you as soon as I can. I trust you’ll enjoy this recipe as much as we did, and I hope it’s one you’ll reach for year after year when it comes time to celebrate Oktoberfest…and beyond. If there is ever anything I can paint for you, from glassware to fabrics, to ceramic tiles, please don’t hesitate to email me: info@kudoskitchenbyrenee.com or visit one of my shops: Etsy and Wazala. Not everything I share on my recipe posts is listed in my shops (example above). However, if see something you’re interested in I always welcome special orders, and will happily paint and design from any photo, idea or description you send my way. Gosh this is seriously the most comforting meal ever. I know what my husband is getting for dinner! It seriously looks amazing and we always love trying something new. Kacey, I know you’ll be able to alter the recipe to fit the quantity you’ll be needing. I hope your husband enjoys it! I love that you used pretzel rolls! Yum!! Thank you, Katerina. I know your family will love it! I love the idea of using the pretzel rolls in this! I never think to cook German food but I need to start! 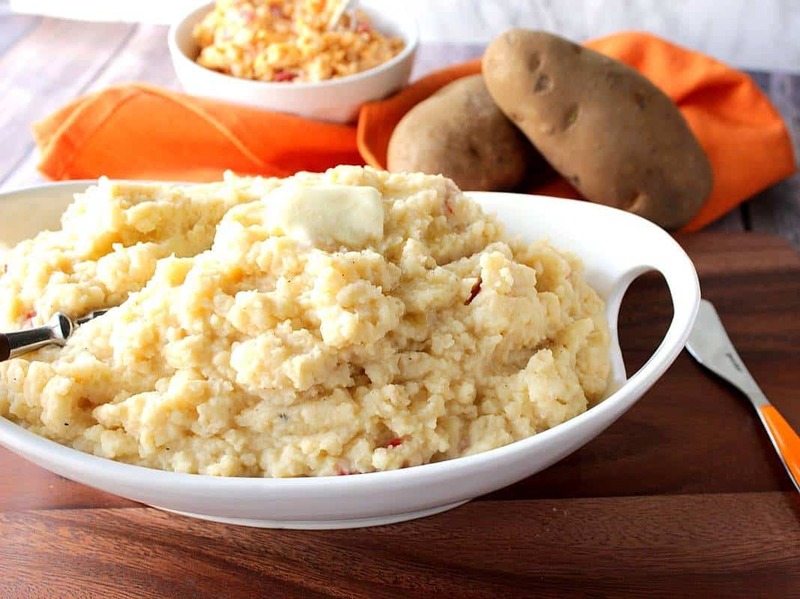 Love this amazing comforting dish. As soon as the weather turns cooler, my mind immediately goes to German cuisine. I’m glad you like the recipe, Ashley. I love German flavors, too – and oh my gosh, I just want to savor a big helping of this with a beer to wash it down. German cuisine is my go-to as soon as soon as the weather changes. A nice cold beer is the perfect accompaniment! Thanks, Heather. Love that saying “Jackpot of flavors” Thank you, Kimberly. 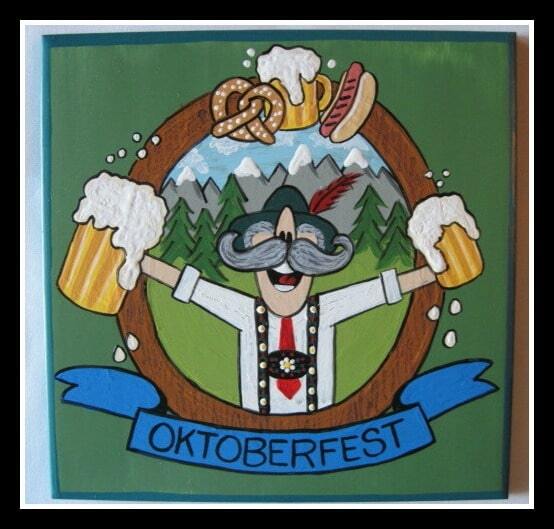 I haven’t been to Oktoberfest in ages, but this would probably be the next best thing — yum! Totally perfect for Oktoberfest! Adding this to my must make list asap! Thanks, Angie. I hope you enjoy it! Renee, these flavors together sound like absolute perfection! Thank you, Kristen. I love German ingredients. I love that you used pretzel rolls! Yuuuum! I saw this on facebook and was just floored by it. It’s such a cool recipe. You really knocked this out of the park Renee. That mean a lot to me, Kim. Thank you so much! Looks great! Beautiful shot too. What a great meal! So elegant looking and full of such wonderful flavors. Absolutely delicious, I’m sure. Such a fun recipe! Pair it with a cold beer and this may be perfection! A cold beer is a must! Happy Oktoberfest! This German girl approves. Wow, this has got to be absolutely fantastic! From one German girl to another, I’m glad you approve. Thanks, Johnna!